Snyk.io and Java Magazine: Clojure usage "remarkably high"
This is an excerpt from JVM Ecosystem Report 2018 published by snyk.io on 2018 Oct 17. 5. What is the principal JVM language you use for your main applications? 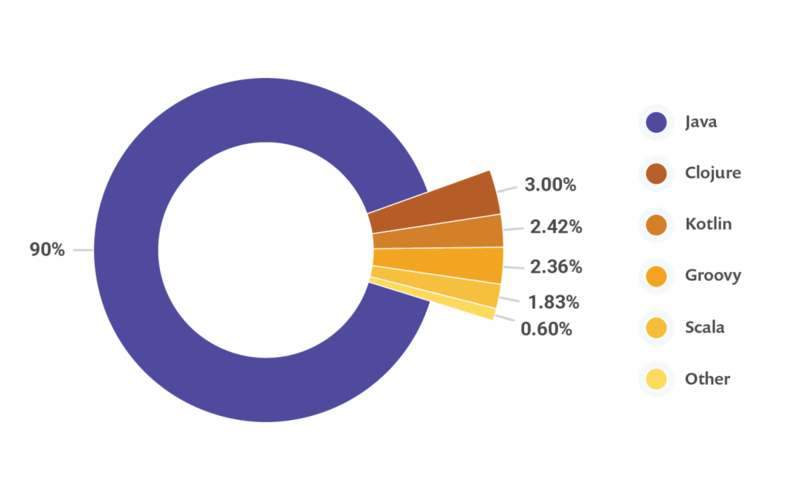 Exactly 9 in 10 JVM users are using Java for their main applications. ... Despite this strong preference for Java, JVM-based developers have consistently shown great interest in other JVM languages ... The 3.0% figure for Clojure is remarkably high and signals–to us at least–the continued interest in functional programming. The functional orientation of many Java 8 features shows the imprint of functional programming on Java itself.